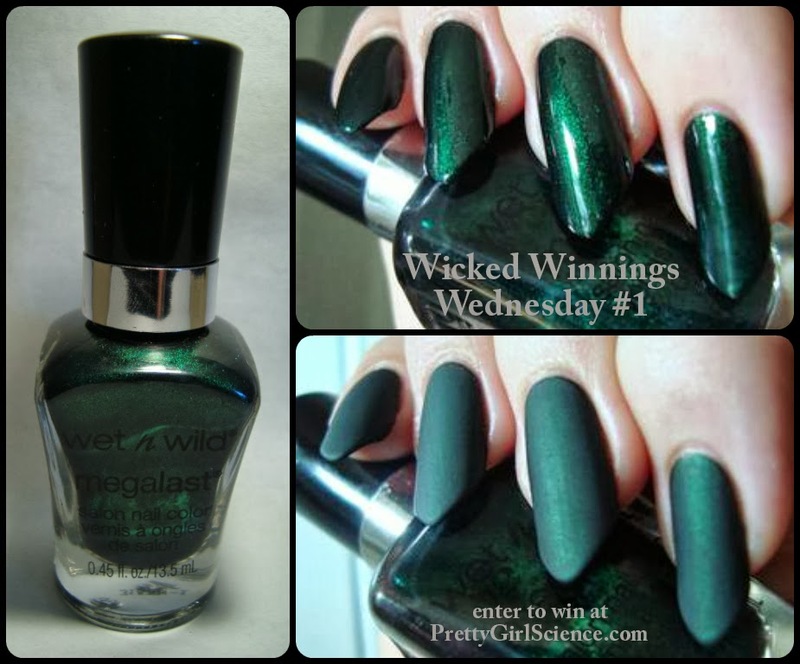 Nichole mentioned the overall meh-ness of this year's Wet n Wild Halloween polishes. She's mostly right...because she doesn't shop at Walgreens that often. Wet n Wild may have fallen seriously flat for Halloween this year except for one major thing. They've rereleased last year's Pick Your Poison collection! It's exclusive to Walgreens, just like last year. It was a good collection overall, but had one standout, Poison Ivy. If you missed it last year and have been pining since...RUN to get it. It flew out of stores last year and probably will again. I had to revisit it...and share a bottle with one lucky winner! What better polish to kick off five weeks of giveaways? Poison Ivy has endless emerald green shimmer in a sheer black base. 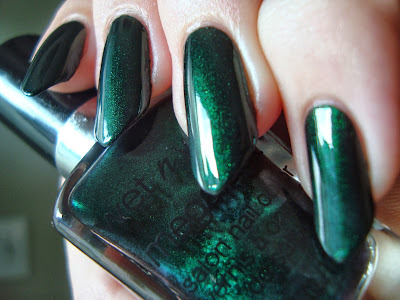 With a collection as big as mine, it's hard to pick favorites...but Poison Ivy is unquestionably one of them. 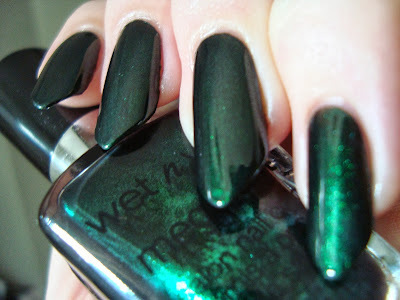 Probably my favorite by Wet n Wild and a favorite among shimmers, greens, blackened bases....it's just an all-around favorite. Such a stunner! Not just phenomenally beautiful, it's also well behaved. Two coats, no serious brush-stroking, etc. It's a little on the thick side because of the heavy dose of shimmer, but still smooth. 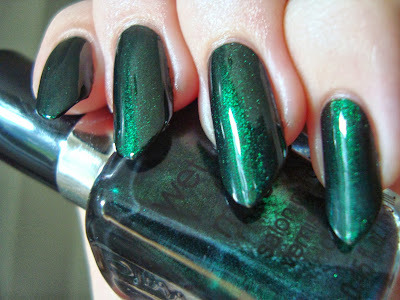 The black base makes it deep and lively in a way that a green-in-green shimmer wouldn't be. The effect is similar to the burgundy-in-indigo glow of OPI Every Month Is Oktoberfest, which I wore again last week, also for the first time in about a year. For both polishes, words can't really cover the effect. "Glow" doesn't really do it. There's a liveliness in the right light that I just can't describe. Even when the shimmer isn't bursting out, Poison Ivy is still obviously green. It only ever looks black on me in very low light. I mattified it last year, so I had to repeat that too. It mattifies beautifully. 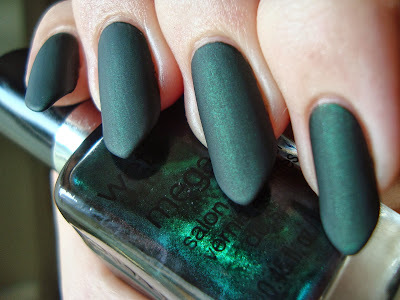 For the rest of the collection, check out my swatches from last year. ...and now the giveaway! Enter to win a bottle from the rerelease. I checked Zeus' new bottle against one of my old ones and they're the same. It's not like the stunt Wet n Wild pulled with the Ice Baby collection a few months ago, when they released similar polishes with the same names as the originals.